[Episcopal News Service] Many years before he would become the presiding bishop’s canon for ministry beyond the Episcopal Church, the Rev. Charles Robertson was a comic book fan. “I learned how to read on comic books,” Robertson said. The first he remembers reading was “Superboy and the Legion of Super-Heroes,” a futuristic and optimistic fantasy in which the forces of good fight the forces of evil. Superhero conventions might not seem an obvious place to discuss Jesus and the Gospel, but fans of comic books and the Good Book will take center stage Sept. 29 as Virginia Theological Seminary hosts ΘeoCon – pronounced “theo-con,” for theological convention. Its tagline is “where theology meets pop culture,” and Robertson is on the list of presenters and panelists. The Rev. Charles Robertson, the presiding bishop’s canon for ministry beyond the Episcopal Church, is seen in a promotional graphic for ΘeoCon, in which he is participating on Sept. 29. “I jumped at this for a couple reasons,” Robertson said. 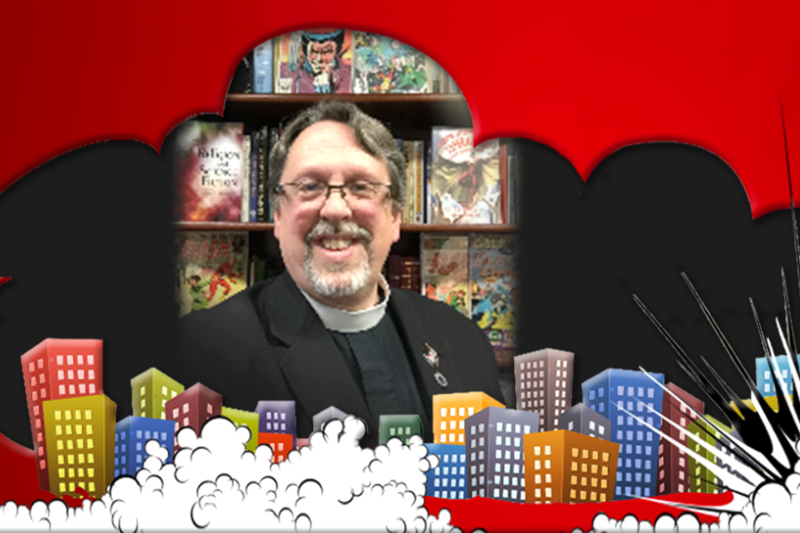 “Pop culture is so much a part of our culture now, and yet I think that we in the church often are slow to engage with things that are current.” He also sees fertile theological ground in discussions of the myth-creation at the core of comic books and science fiction. Comic-cons have become big events across the country and big business, with the comic and film industry rolling out samples of their upcoming content for a hungry fan base. There’s the New York Comic-Con next month, with panelists including “Lord of the Rings” director Peter Jackson. San Diego Comic-Con is said to be the largest in the country and regularly features big-name Hollywood franchises. And this weekend’s Baltimore Comic-Con, which bills itself as “American’s Greatest Comic Book Convention,” coincides with the one-day ΘeoCon at the opposite end of the Washington, D.C., metro area. At Virginia Theological Seminary, in Alexandria, the fun kicks off at 9 a.m. Sept. 29. In addition to Robertson, participants will include the Rev. Judy Fentress-Williams, an Old Testament professor at the seminary; the Rev. Patricia Lyons, the Diocese of Washington’s missioner for evangelism and community engagement; and the Rev. Wesley Sun, an American Baptist Churches minister who produces graphic novels through Sun Bros Studios. The event was created by Shayna Watson, who earned her Master of Divinity from Lancaster Theological Seminary and an Anglican Studies diploma from Virginia Theological Seminary. She is now curate at St. Stephen’s Episcopal Cathedral in Harrisburg, Pennsylvania. Superman is a notable example: a boy from a dying planet is sent here to save our planet. “Star Wars” is another science fiction fable with parallels to the story of Christ, featuring a swashbuckling savior figure mastering the Force to defeat the Dark Side. “With everything that’s happening, the things that are about to come to light, people might just need a little old fashioned,” replies the character Phil Coulson of the S.H.I.E.L.D. agency. One thing he thinks people are seeking is “heroic” stories. “One time our kids knew the stories of Biblical heroes,” he said, and the “new myth-making” underway in sci-fi fiction and comics comes at a time when many people have grown cynical about our real-life leaders.